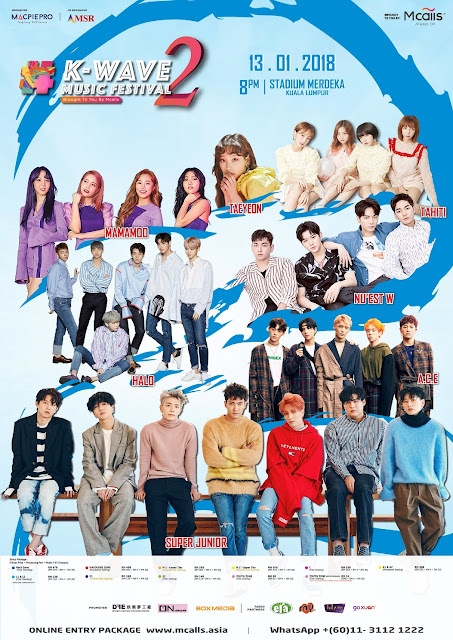 Kuala Lumpur, December 2018 – This upcoming 2018 is going to be a great year for K-pop fans as you need to get ready for the return of a mega K-pop music festival featuring a massive lineup of 7 acts! Its attractive deal is going to make you look forward to the New Year! 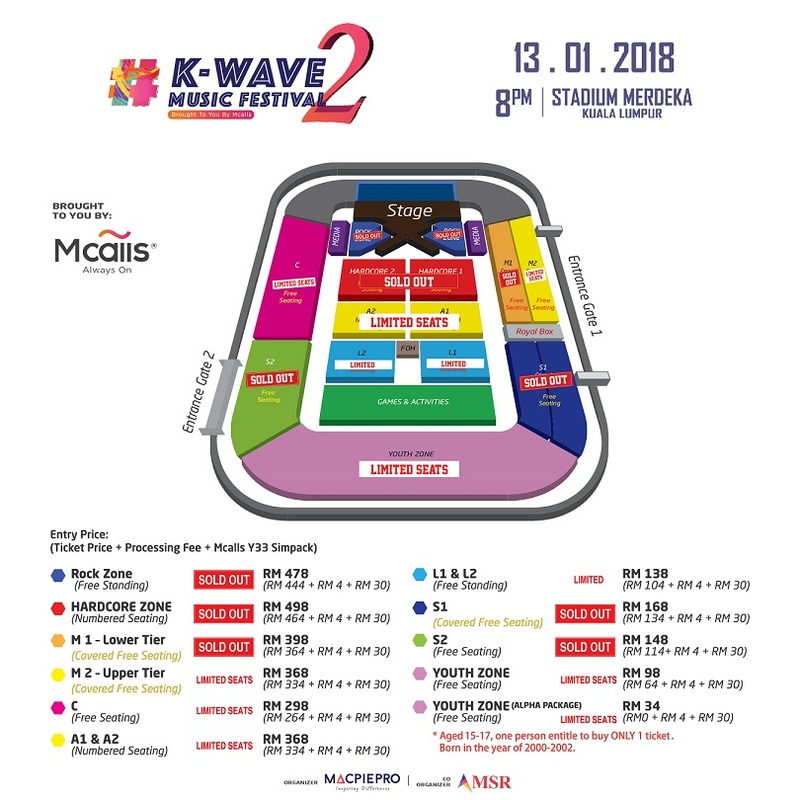 Organised by MacpiePro, the highly anticipated K-Wave 2 Music Festival “Brought To You By” Mcalls is set to make a comeback on 13 January 2018 (Saturday, 8pm) at Stadium Merdeka, Kuala Lumpur! Door opens from 3.30pm onwards. The event is split into 2 sessions with the first session from 3.30pm to 7.00pm for games & activities. The second session from 8.00pm onwards for the concert. This marks the second installation after the successful run of the first K-Wave Music Festival “Brought To You By” Mcalls last August. THE WAVE CONTINUES! K-WAVE 2 MUSIC FESTIVAL “BROUGHT TO YOU BY” MCALLS, MOST AFFORDABLE CONCERT EVER FOR YOUTHS! Malaysian ELFs (acronym for EverLasting Friends, the group’s official fan club). In addition to that, we should also make ways for the debut appearance of our beloved SNSD TAEYEON as a solo artiste in Malaysia. TAEYEON is the lead singer of the acclaimed group Girls’ Generation. SONEs are in for a treat to be seeing her performing solo live for the first time. Also performing for the first time in Malaysia is MAMAMOO, an uprising 4-member girl group known for their powerful vocals delivered in the style of retro, jazz and R&B. The 4-member boy group NU’EST W, which stands for NU(new), Establish, Style, Tempo and Wait, returns to Malaysia for this festival after almost half a decade. Part of the lineup that will be making their Malaysian debut are newly formed group A.C.E, known for using the genre Hardstyle in their music; and TAHITI, an all-girl group made up of 4 members. Hexagon of Absolute Light and Organization, or better known by their acronym HALO, is set to ride the wave again with their fans at the festival. The festival marks an important milestone for the organiser MacpiePro to ignite more live experiences in the future. In line with the idea of “MUSIC WITHOUT STRESS”, Chief Executive Officer of MacpiePro, Ciang Teng and Mcalls came up with entry packages exclusively for the youths to be part of the festival without worries. The festival will also integrate fun and myriad interactive activities and games for festival-goers to participate with their purchased entry packages to enter the venue before the show kicks off. (Malaysians aged 15-17 (Born in the year 2000 to 2002) is entitled to 1 (One) Youth Zone Alpha Package at RM34, consists of a Youth Zone ticket and Mcalls Y33 SIM Pack with processing fee). Entry Packages are available at www.mcalls.asia. Like MacpiePro on Facebook at www.facebook.com/MacpiePro to look out for the latest updates!